Kerb-side lanes are considered international best practice and have been widely in use overseas for decades, including in Europe, New York and Australia. Melbourne (Swanston Street): Implemented kerb-side separated bike lanes resulted in 80% of riders feeling safer due to the separation from motor vehicles, and 45% of riders ride more often as a result of the treatment (VicRoads 2007). Melbourne (La Trobe Street): Implemented kerb-side bike lanes in June 2013 by reducing four traffic lanes to two lanes on La Trobe Street that is used by 20,000 vehicles per day . By February 2014 the number of cyclists doubled in the morning peak to 380 per hour and trebled in the PM peak to 335 per hour. Motor vehicle travel times temporarily increased immediately after the bike lanes were introduced but have now returned to pre-bike lane times. 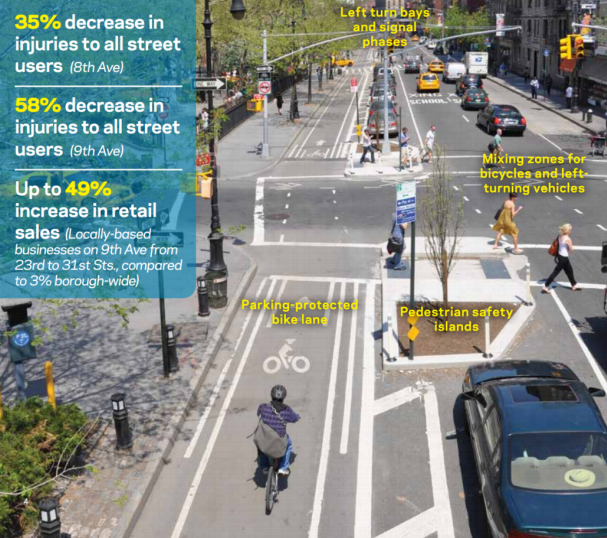 New York (Grand Avenue): Implementing kerb-side separated bike lanes resulted in a 29% increase in ridership, and a 27% reduction in injuries to all street users (drivers, bike riders and pedestrians). And here’s what they look like in The Netherlands. This route (dating from 1960’s/70s) goes right by a large high school with 2400 students. Images created on Streetmix as a guide only – not to scale. 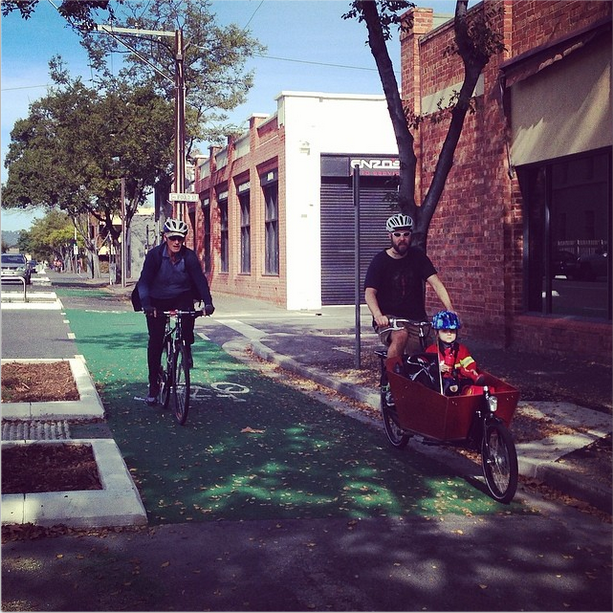 ‘Kerbside’ bike lanes – bike lanes are between the footpath (‘kerb’) and parked cars – Also known as ‘Copenhagen-style lanes‘. If the lane isn’t wide enough, it may be difficult for faster cyclists to overtake slower riders, which could result in them using the traffic lane instead.